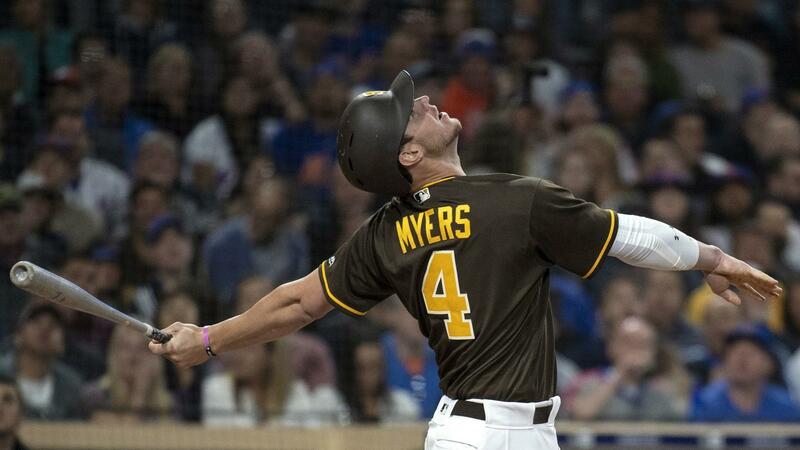 When Wil Myers was acquired by the San Diego Padres in a three-team trade involving the Washington Nationals and Tampa Bay Rays in December of 2014, he was expected to be the face of the franchise amid a flurry of deals made by new GM A.J. Preller. Myers was the Opening Day starter in center field to begin the 2015 season, but made three separate trips to the disabled list throughout the year and only managed to suit up for 60 games. The first half of the 2016 campaign has proved to be the best baseball Myers has played in his career, as he entered the all-star break hitting .285 with 19 home runs, 60 runs batted in, 61 runs scored and 15 stolen bases. His hot start earned him a spot as a hometown representative in both the 2016 Home Run Derby and All-Star Game. Ever since the midsummer classic two years ago, however, Myers hasn’t come close to that level of production. He has moved from the outfield to first base and then back to the outfield, and quite honestly hasn’t looked very impressive at either of those spots. He’s posted a negative Ultimate Zone Rating (UZR) for his career both at first base (-0.3) and in the outfield (-1.6), and has been worth -6 Defensive Runs Saved (DRS) according to Fangraphs. But hey, maybe you prefer the eye test over the new-age advanced metrics. That’s fine, but he’s undeniably appeared disinterested at times and couldn’t have possibly been mistaken for a plus defender. Offensively, his power has remained consistent (30 HR, .464 SLG % in 2017), but his batting average has consistently been living in the .240s and he continues to strike out at a high clip. So, who is the real Wil Myers? And how does he fit into the Padres’ present and future? Well, to speculate on the first question, probably somewhere between the two extremes of first-half-2016 Wil Myers and second-half-2016 Wil Myers. It would be unrealistic to expect him to consistently produce top-tier numbers, but it is much more believable that he’s a better player than he’s showed recently. A healthy Wil Myers can consistently hit .260-.270 with 30+ HR and 90+ RBI. 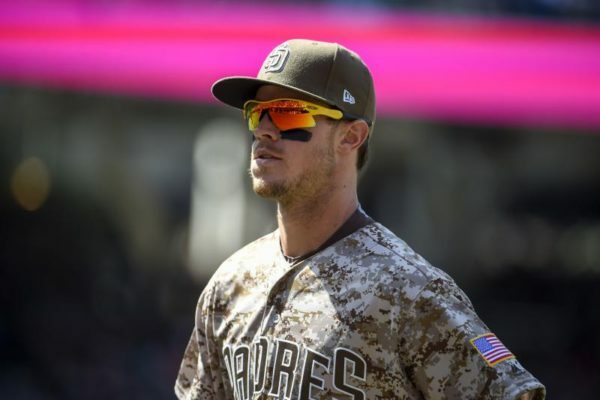 He’s still just 27 years old and has all the talent in the world, but at what point do his struggles with inconsistency and injuries become too much for the Padres? Say Myers returns from his current oblique injury, for example, on June 15. That would theoretically give him 46 days to prove to the organization that he’s still a long-term piece before the Padres make a final decision on him for 2018, when the trade deadline rolls around on July 31. Regardless of production upon his return, however, he doesn’t project to have a ton of value on the trade market. The back-loaded extension he signed in January of 2017 will pay him $22.5 million in 2020, 2021 and 2022. He will earn $4.5 million this year, $5.5 million in 2019, and the Padres have a $20 million club option in 2023. In other words, teams will surely be hesitant to deal for a statistically declining player with major injury concerns who will take up a significant portion of their payroll for years to come. If the Padres, theoretically, were to hold on to him past the 2018 trade deadline, he would still have to show that he can produce at a $20 million-per-year level. If he can’t, Preller will have a tough decision to make: salvage what’s left of his value on the market and hope he hits on one of his patented diamonds in the rough, or keep him on the team long term and risk him potentially blocking a young outfielder who can produce similar numbers at a much cheaper price. It is hard to find the answers to these questions. Padres fans can only hope that A.J. Preller finds these answers, because how he approaches this situation will undoubtedly go a long way in determining the success of the current rebuild. One thing is for certain, however–if Myers doesn’t start producing at the level we all know he is capable of, Preller will be forced to make an extremely difficult decision that will surely anger a good portion of the fanbase either way. The other option, of course, would be for Myers to make this a whole lot easier on everyone and get back to raking. Agreed, the Padres are in a bad spot with Myers. Poor decision to trade Trea Turner for him, idiotic choice to try him in CF, incomprehensible decision to sign him to a massive extension, and now he is very clearly not acting too motivated. Only 27, but with his contract, performance and injury history he is moving towards bad contract swap territory. Although a serviceable player, the club probably needs to move on from him and trade him this year. Give those ABs to high energy players like Jankowski and Cordero.